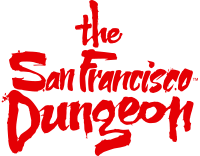 The San Francisco Dungeon is a 60 minute journey through San Francisco's past from the Gold Rush to Alcatraz. We're an exciting mix of 9 live actor shows, 200 years of history, 360° sets, and authentic storytelling. Take a trip through San Francisco's hysterically horrible past! Our unique take on history has made us one of Europe's best-loved visitor attractions. But now, for the first time, we have arrived in the USA! San Francisco is the perfect venue; filled with history, intrigue and colorful characters.